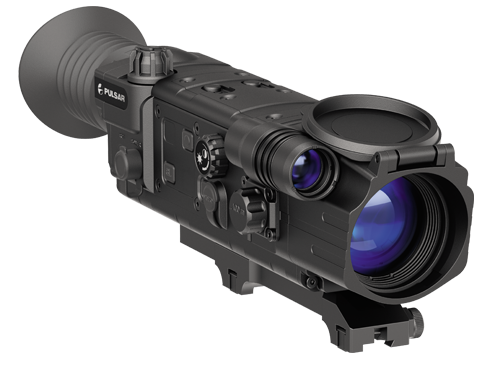 The Digisight N770/ A/ U/ UA riflescopes are outfitted with built-in IR Laser Illuminator featuring three-step power adjustment. Complying with Class 1 laser safety, the laser IR Illuminator operates in the covert IR range (915 nm), invisible to the unaided human eye. Operating time can be significantly extended by using high-capacity external power supply units attached to the Digisight via an external power jack. During continued use in freezing weather, the external power supply units can be stored under the clothes. Ability to operate in normal mode at sub-zero temperatures is due to the use of a frost-resistant OLED display featuring fast response and provides crisp image when observing dynamic object.